When a long time friend who lived in Greenville, SC kept asking me to visit, it was perfect timing. I finally relocated to Greenville, SC, five years ago, a town getting a ton of buzz with its own hashtag, “#yeahthatGreenville.” With a burgeoning foodie scene and plentiful outdoor recreation opportunities, plus an enviable location within a short driving distance of the mountains and the coastline, no wonder Greenville’s charm has been beguiling tourists. 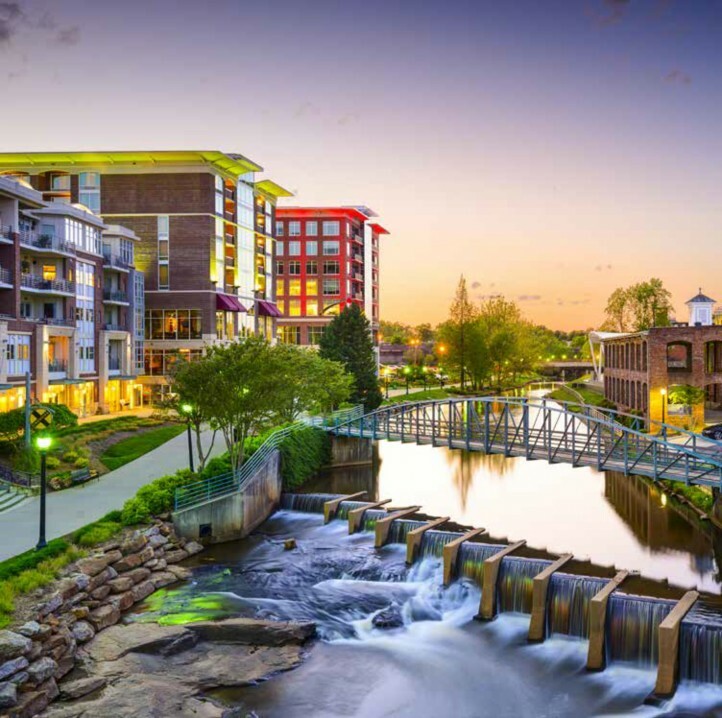 A city that’s a little over an hour flight from New York City and Palm Beach, Greenville has consistently been racking up accolades from USA Today, Southern Living, Fodor’s Travel, Thrillist, Zagat and Trip Advisor. First, you’ll need a top quality cup of coffee, so start off at Methodical Coffee in The One Plaza in the center of town on Main Street. The baristas here are passionately committed to making the perfect pourover or a luscious latte, utilizing their very own roasted beans. 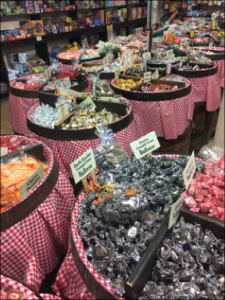 In the plaza you’ll also find Mast General Store, the real deal since 1883 with its legendary old-fashioned candy collection. Greenville is not a high fashion town with Upper East Side or Worth Avenue flagships, but fashion finds abound on Main Street include Taz Boutique for trendy clothing and jewelry, and Cone & Coleman right around the corner for elegant, European labels such as Paula Ka. 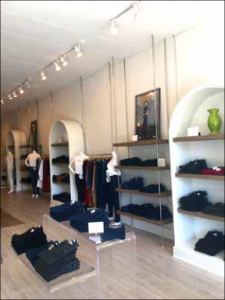 Also, seek out the curated contemporary fashion at J. Britt and high-end resort wear at Splash on Main. For a custom-made clothing experience, Billiam is the place for women and their guys to get premium selvedge jeans made to measure in vintage denim, just slightly beyond Main Street. Stop in at Grill Marks for a gourmet burger, sandwich or salad and a boozy milkshake called a Spiked Float, then visit Vintage Now Modern, Greenville’s unique French Country home décor and home furnishings shop, featuring a bevy of beautiful vintage finds and luxury linens from Bella Notte. If you’re feeling sporty, walk or rent bikes downtown at Reedy Rides and hop right on the Swamp Rabbit Trail which goes from downtown for miles all the way up to Traveler’s Rest, stopping at Swamp Rabbit Café & Grocery to re-fuel with gourmet goodies and baked goods. Gorgeous Soul Yoga is the place to get your OM on. Evening means entertainment and Greenville is home to four theaters; The Warehouse, Centre Stage, Greenville Little Theater and the Peace Center who features Broadway touring shows and a variety of music acts in a top-notch venue akin to Lincoln Center. Finish off the night at SIP, a rooftop lounge ablaze with sparkly lights where you can toast to your vacation with a cocktail under a canopy of stars. Ask me to meet you anywhere in the south and I am in. I am a southern Girl at heart and love a great getaway. My weekend in Greenville was a reunion with my longtime girlfriends Kim and Kathy. A quick flight from Ft. Lauderdale to Greenville for a mere $68 on Alliegient Air and approximately 2 hours later I was there. We enjoyed a delightful stay right in the center of town at the brand new Embassy Suites Hotel- An all-suite hotel with big rooms and a stay that is inclusive of a full buffet breakfast and nightly happy hour. It is also home to Ruth’s Chris Steakhouse which is a perk. This is a great place to stay. 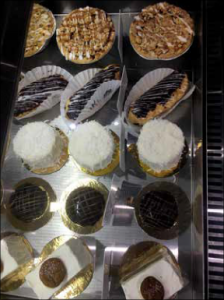 One morning I skipped out on breakfast to try Caviar & Banana’s — a delightful bakery/cafe and gourmet food store. This amazing place has a fantastic selection of incredible prepared foods, yummy baked good and delectable foodie gifts. With locations also in Charleston and Nashville I hope they continue to grow as I want them to be everywhere! Of course, Greenville has a host of restaurants and shops and I would weekend here anytime just for that. I heard that the famous Beija-Flor’s Jeans were housed here and I just had to see for myself if they were the best fit as the rumor started by Oprah Magazine said they were the best jeans ever. Happily I agree. They are. These jeans are impeccably designed by the Mother/Daughter team of Kathy Moça and Emilie Whitaker. Inspired by the figure-flattering designs they saw while living in Brazil, they created Beija-Flor’s line to work with a woman’s curves rather than against them. We enjoyed some of the best dining over the weekend. We definitely dined on one of the best steaks we ever had at Larkins on the River. The service at Larkins was impeccable and the atmosphere fantastic. It was a gorgeous night and we enjoyed dinner on the terrace while having the privilege of hearing an awesome band on the outdoor stage of The Peace Center. This town is not short on arts and culture. With many other eateries in town from Italian, French, Mediterranean to Classic American everyone will be able to find a favorite spot. Our favorite place was Sunday Supper at Soby’s the goods come from local farmers and producers and the chefs transform Old Southern favorites. We spoiled ourselves with fried chicken, fried green tomatoes, she-crab soup and shrimp and grits. Yes, we were in southern heaven. Carl Sobocinski, the Founder of Table 301, a restaurant group that includes Soby’s New South Cuisine, Soby’s on the Side, The Lazy Goat, Table 301 Catering, NOSE DIVE gastropub, Passerelle Bistro and Papi’s Tacos and a couple of Juice Bars really has it going on. This man with a plan is one to watch. 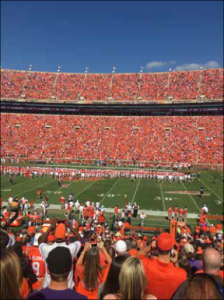 Close by is Clemson University – and we happened to catch the homecoming game which made the weekend that much better. Greenville with all of its southern charm, culture, great dining and shopping is grand.